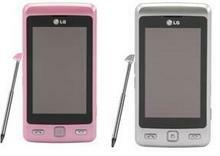 The LG Cookie is now available in pink and silver. Um. Well… The pictures going to look a bit unbalanced if I don’t write anything else, isn’t it? Cookies. Cookies. My favourites are those ones you get in little red packets in the hairdressers, that taste a little bit of burnt sugar. Oh, and the white chocolate ones from Millies Cookies. Being an affordable touchscreen phone means the Cookie takes a few knock backs in the specs department, i.e. no 3G or GPS, but it was either compromise on the specs and provide the “UK’s most affordable” handset for touchscreen wannabes, or the complete opposite. As we all know high specs cost, and with a touchscreen thrown in on top, the cost is even higher. That’s the beauty of this handset – the specs are still pretty decent for what it is and it’s a full 3-inch display touchscreen phone. Its specs do include a 3 megapixel camera, FM radio, Bluetooth, an accelerometer, and video recording capabilities at 12fps with a resolution of 320×240. However, it won’t play back anything more than 240×400 and 24fps. The colours are exclusively available to Orange customers. The PAYG version is £99.99 or £15/month on a 24 month contract. Netbooks to get their very own &apos;Lite&apos; version of Windows 7?